Luckily, we only applied those fugazzi ESPN stats very briefly, and left off right after. Let’s revisit our assertion with the proper information and then get back on our way. I’ll post the corrected Team Stat Totals, along with Team Quality Start % directly below. To be crystal clear going forward, the roto results being referenced are from a 2018 Fantrax 500 5×5 standard roto format. In this part of the series, we’ll use our league wide QS stats to more closely examine its rate of frequency at the individual level. This info may draw us towards a conclusion as to whether or not the roto community’s hatred for Quality Starts is warranted, or just petulant sour grapes (My gut as well as our previous work thus far says that it is indeed warranted). As earlier hypothesized, we will most certainly find a correlation between the number of Quality Starts and the roto finish by position rank at the elite levels. My inference is that this correlation is not a case of causation, and as we get outside the top consensus aces there will be a undeniable variance between Quality Starts and 5×5 Roto Category finish. So for now the assertion remains that the QS can be utterly ignored on the way to roto glory. During this seeming decimation of the importance of a Quality Start, I hope this doesn’t dissuade my fellow head to headers from its importance in the point game. 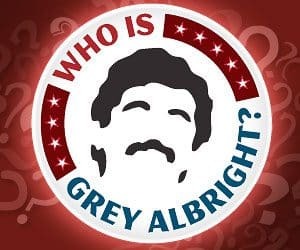 In the third installment, we’ll get into some detailed custom Quality Start stats and see if we can determine an edge when drafting point league pitchers. For the time being, lets see if we can put a bow on the admittedly more boring and less substantial Roto side of this experiment. 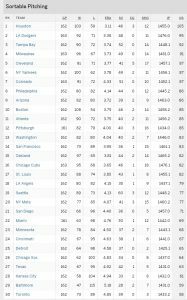 TEAM QS STATS ORIGINALLY USED AND INCORRECT : 30 teams start 162 games (4,860 starts). There were 2361 Quality Starts (2361 / 4860) or 48.6% of all GS were QS in 2018. TEAM QS STATS UNORIGINALLY USED AND NOW CORRECT : 30 teams start 162 (4,860 starts). Two teams had one extra (4,862 starts). There were not 2361 Quality Starts, there were 2,011 Quality Starts so (2,011 / 4862) or 41.4% of all GS were QS in 2018. Even having seen our perception for the league average in Quality Starts just drop 7% to its actual 41%, my initial feeling here is that our Quality Start Percentage Comps will still be underwhelming at best. Fantasy guys love numbers, so let’s toss some around. 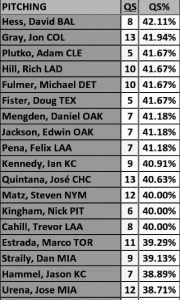 Of 147 Starting Pitchers in 2018, (5 QS minimum to Qualify) 52 players, or 35.4% threw a QS 50% of the time. When we hone in on the newly established league average of 41.4%, it turns out that 92 players, or 62.6% of the qualifying field achieves this more seemingly average accomplishment an above average amount of the time. The names surrounding the Quality Start Percentage (David Hess, Edwin Jackson, Nick Kingham) are no more impressive than the names that found themselves on the outskirts of QS ”excellence” in the 4.50 earned run average department. There may be a few interesting names here, (Jon Gray, Rich Hill and Jose Quintana) but to say there are warts is putting it nicely. A more accurate way to describe this group is in terms usually reserved for an emergency visit to the free clinic (it burns!). Here’s the graphical representation of our hypothesis concerning the elite Starters’ Total QS & 2018 Finish by Position (Confirming the obvious, but it’s always good to see the actual numbers.) SPOILER ALERT: Guys that threw 21+ Quality Starts are all really, really good. Now here’s the graph of individual Quality Start leaders for 2018 and Finish by Position. As we get beyond the elite level of 21 Quality Starts, correlation to finishing roto rank begins to go out the window. This is not a total shock coming from our initial premise, understanding the roto game doesn’t disproportionately reward the QS. However, the conclusion of how that 41.4% QS rate fits into our comparisons for the Quality Start as a measure for excellence across roto formats seems to be revealing itself. The short answer? It doesn’t. Game, set, match. Now get out of here, have a nice weekend and don’t forget to tip the waitress (Grey didn’t bring me here for short answers, luckily). At this point, I’m going to oversimplify a bit BUT any list that has James Shields at the top and Lucas Giolito + Dylan Bundy over anyone with a pulse is to be crumbled up, thrown away immediately and forgotten over some small batch bourbon. The correlations of Quality Starts to finish roto rank simply isn’t there. I am a lifetime New Yorker; I am a fat, stubborn mule; I have been arguing my entire life and am a heavyweight champion in the art of bullsh*tting; But even to an ardent H2H defender, it seems only reasonable to concede the irrelevance of Quality Starts in the Roto game. This being my first taste of baseball writing, I actually did a little bit of shoe leather reporting and got a quote from noted high stakes Fantasy Baseball player, podcast host & all around great guy Matt Modica who did not mince words saying, ”I hate Quality Starts. I understand wins are devalued and not the measure of SPs in today’s game.. but Quality Starts are a garbage stat in my opinion.” Well, Mr. Modica you have thoroughly nailed the mark in under 20 words what took me nearly 2000. You are a gentleman, and a scholar. The meds are wearing off and John Jr. is starting to scream bloody murder so it’s probably time for me to close the curtain on this leg of our investigation into the pertinence of the Roto QS. It’s been a bit of a journey to put some statistical merit behind our initial assumptions, and I know sometimes the juice does not always seem worth the squeeze. 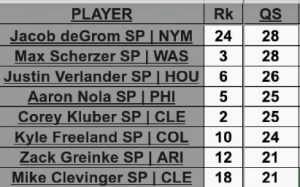 We didn’t disprove our assumptions or reinvent the wheel, but I’m glad we did the legwork as I now feel confident as a full-on detractor of the Quality Start in Roto leagues, and true pitcher evaluation in general. What do you think about Roto leagues adopting Wins+Quality Starts instead of the traditional just Wins category. Our league moved to that format a few years ago to reward pitchers who pitch well but their team lets them down and doesn’t get them the win. In points I think you have to decide between Wins, and Quality Starts. Neither is perfect, in fact both are greatly flawed. However, in my opinion its not a bad idea to use each as a category. Offensive categories are often tied together; Obviously HRs always result in both R & RBI. So I think it can definitely work. I have been against using QS the last few years after my league adopted it some time ago, as a means to balance out ‘all-RP’ staffs. The process and reasoning etc may be flawed but, let’s skip past all that. Is there another stat besides QS that would be viable as a sort of SP-only stat? We have been struggling to find one. Question for the teacher and class: So if you want a league more “robust” than the standard 5×5, what stats would you include in order of preference? Clearly a man of the same ilk as myself; Always looking for ways to make the game more fair and rewarding of talent. Ive always been against using BA, and instead using OBP because in my opinion those walks are earned and a valuable part of a hitters profile that is ignored in a classic 5×5 format. So I think youre doing a damn good job. Congrats on Little John BTW! I’ve got a small herd myself and thoroughly enjoy being a dad! Yes, congrats on the baby! I thought ESPN went off the air years ago, my bad. I wish the QS could be changed to 7IP with 2 or less earned runs allowed. I would be curious to see if this is a better reflection of the top starting pitchers. When are you going to finish the top 10 prospects by team? You have 10 left to do. The NL east and Central? My 7×7 roto league has both Wins and QS. Definitely going to be following along with this.